Arrange sardines on a heat proof dish. Blend ginger and oil from sardines to form a paste. Heat oil in pan and lightly fry paste until fragrant. Pour mixture on top of sardines and steam for 5 minutes. Meanwhile, heat soya sauce and water and add sugar to taste. When sardines are ready, pour soya mixture over them and serve hot. 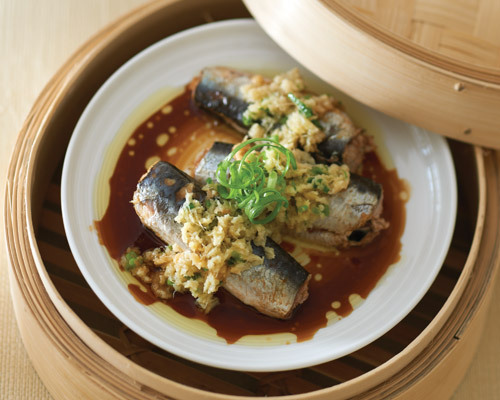 Comments: The rich flavour of sardines marries well with ginger, spring onion and soya sauce producing a full-flavoured dish that is delicious and healthy! Sardines are an oily fish, which are very rich in omega-3 fatty acids. Omega 3 fatty acids can boost heart health, lower triglycerides and may help with other conditions -- rheumatoid arthritis, depression, and many more. This fish is one of the rich sources of fish protein and is rich vitamins, A, B, C, D and E. Various minerals occur in the fish such as iron, calcium, phosphorous and potassium. It is also one of the few foods that contain the antioxidant, Coenzyme Q10. This recipe is fairly low in sodium and therefore makes it a heart healthy dish!